Over the weekend of 5th – 6th March, our two registered bands made their annual trip to St George’s Hall, Bradford to compete in the Yorkshire Regional Championships of Great Britain. Playing the formidable Edward Gregson piece, Essay and with no hiding place for any one band member on stage, great effort and skill was demonstrated, giving it their best shot on the day. Under the direction of its relatively new MD, Jim Davies, the band delivered a positive performance. Alas, the final top six places were just out of reach as Skelmanthorpe were placed seventh on the day. Despite this, the band is now in a relatively strong position within the first section to achieve a fantastic result next year and hopefully recover posession of its championship status. Due to the refurbishment of St George’s Hall, next year’s Yorkshire Regional Championships will take place on the 4th and 5th March at Huddersfield Town Hall. 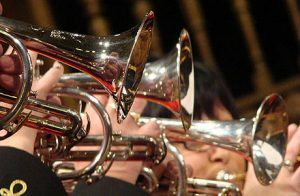 This entry was posted in News-All, Skelmanthorpe Band, Skelmanthorpe Propect Brass. Bookmark the permalink.